Enjoy a warm welcome at the DoubleTree by Hilton Istanbul – Piyalepasa hotel and enjoy a signature chocolate chip cookie upon arrival to help you feel settled in. 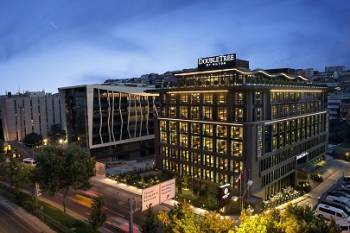 Located only three kilometers from historic Taksim Square and the bustling shops, restaurants and bars of İstiklal Street, the contemporary DoubleTree by Hilton Istanbul – Piyalepasa hotel is only 30 minutes east of Atatürk International Airport. Experience real Turkish culture at Taksim Square and shop till you drop at Nişantaşı – one of Istanbul’s best shopping districts.Retire to a spacious guest room or suite at this Istanbul hotel. All rooms are stylishly decorated and are fully equipped with modern amenities. Upgrade to a suite for extra space, including a separate living area and sofa bed; ideal for relaxing. Host a meeting in one of our flexible, naturally-lit meeting rooms or host a celebration in our ballroom.Keep up with work at the business center or maintain your fitness regime using the cardio equipment and free weights at our fitness center. Swim laps in the indoor pool or visit the spa for a treatment or soak in the soothing whirlpool.